YOU MUST PROVIDE EITHER BANK DRAFT OR CREDIT CARD INFORMATION! 1. Monthly Auto-Debit: Most inexpensive! Most convenient! Most preferred by BPA! Monthly auto-debits from checking acct. paid on the 15th of each month. 2. Monthly charge to your credit card or debit card. A 4% CONVENIENCE FEE WILL BE ADDED TO ALL CREDIT CARD CHARGES. We accept Visa, MasterCard, American Express and Discover. Monthly charges are made on the 15th of each month. PRIVATE LESSONS - billed weekly or monthly. 1/2 hour and full hour classes offered in every discipline we offer. *THERE IS A ONE TIME NON-REFUNDABLE $30.00 REGISTRATION FEE FOR NEW STUDENTS OR $15.00 REGISTRATION FEE FOR RETURNING STUDENTS. *A COSTUME DEPOSIT FEE of $70.00 will be added to your monthly auto debit or charged to your credit card on Sept. 15th or at time of registration. Costume deposits are NON REFUNDABLE after December 1st. If the actual cost of the costume exceeds the deposit your account will be charged the balance. If paying full year by check please include the $70.00 costume fee. Costumes purchased after December 1st are $80. Tuition is due at time of registration unless paying monthly. The number of classes may vary per month, but monthly payments are divided equally for your convenience and are based on the annual rate. Our studio does not send out monthly statements. 24 hours notice must be given if you are unable to make your private lesson or a $25 fee will apply. PLEASE NOTE YOUR PAYMENT PREFERENCE (monthly payments, auto debit or credit, or full session payment) IN THE COMMENTS AREA AT THE BOTTOM OF THIS PAGE UPON YOUR REGISTRATION. YOU WILL BE CONTACTED SHORTLY FOR CONFIRMATION. Monthly tuition is mandatory until the studio has received a written request of cancellation. Students are expected to keep all tuition payments current. Payments more than 5 days late will be charged a $10.00 late fee. Payments more than 30 days late will incur an additional $10.00 late fee. Payments more than 60 days late will be sent to collections. Late payments or the failure to make tuition payments do not constitute withdrawal from classes or cancellation of an ongoing agreement. Classes missed are not pro-rated or refunded. Tuition payments less any registration fees are refundable on a pro-rated basis for the first 2 weeks. Cancelation of classes requires 30 days notice and must be submitted in person and in writing. After the first 2 weeks refund requests will be considered on an individual basis if there are extenuating circumstances. A $10.00 processing fee is non-refundable. Once a student has withdrawn from classes, there will be a $30.00 re-registration fee charged to re-enroll a student. Upon written notice and proper documentation of a parent or student's death or disability BPA will provide a pro-rated refund of tuition payments. As the legal parent or guardian, I release, absolve, indemnify and hold harmless BROADWAY PERFORMING ARTS , its owners and operators from any and all liability, claims, demands, and causes of action whatsoever, arising out of or related to any loss, damage, or injury, including death, that may be sustained by the participant and/or the undersigned, while in or upon the premises or any premises under the control and supervision of BROADWAY PERFORMING ARTS. Anyone attending the school agrees and discloses that they are carrying their own medical insurance and assumes all risks and hazards incidental to the conduct of the activities. 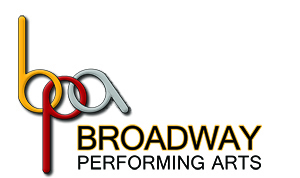 Permission is also hereby granted to BROADWAY PERFORMING ARTS to use photographs or video of students or family members or others for promotional purposes and to copyright such photographs in it's name. I understand that in the instruction of dance and in particular, ballet, physical manipulation of a student by the instructor may occur. This physical manipulation will occur only when assisting the student in the proper alignment and execution of dance steps. I hereby authorize the instructors to physically manipulate myself or my child in order to assist in the proper alignment and execution of dance steps.